The caterpillars feast on tobacco plants, ingesting large amounts of nicotine as they do so. A study in the latest Proceedings of the National Academy of Sciences found that the caterpillars retain nicotine toxin in their blood that they puff out as a noxious warning to would-be predators. Insects have long used plant toxins for their own benefit. There’s even a caterpillar with toxic barf. Both of these compounds are poisonous, as mystery book readers likely know. Poisonous puke is obviously not very appealing, even to voracious ants, so the eastern tent caterpillar’s defense mechanism often works. The Atala butterfly (Eumaeus atala) also acquires a toxic substance from plants that turns off bird and ant predators. Rattlebox moths ingest alkaloids that are poisonous to spiders, which then steer clear of the moths. 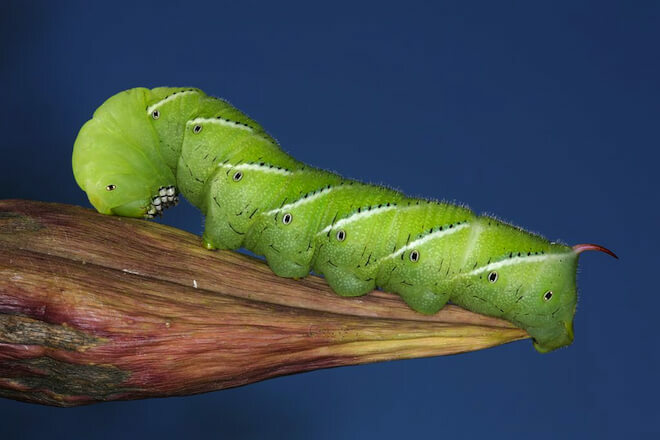 In the case of the tobacco hornworm caterpillar, Kumar and his colleagues from the Max-Planck-Institute for Chemical Ecology found that wolf spiders, which usually consider the caterpillars to be good eats, avoid them if they puff out nicotine. Nicotine is a natural toxin. In humans, as for other creatures, it can be deadly, although it usually takes a lot for a person to succumb to its effects. For example, two brothers died after smoking 17-18 pipes full of tobacco. Health problems can also result if someone touches wet tobacco leaves. Nicotine can absorb into the body, causing everything from nausea to dizziness. The caterpillars, on the other hand, possess a gene that allows them to shunt nicotine into external respiratory openings known as spiracles. It is through these “breath holes” that the caterpillars release their toxic halitosis.